I loved this part of northeastern Oregon! Enterprise and Joseph are just six miles apart but are quite different experiences. 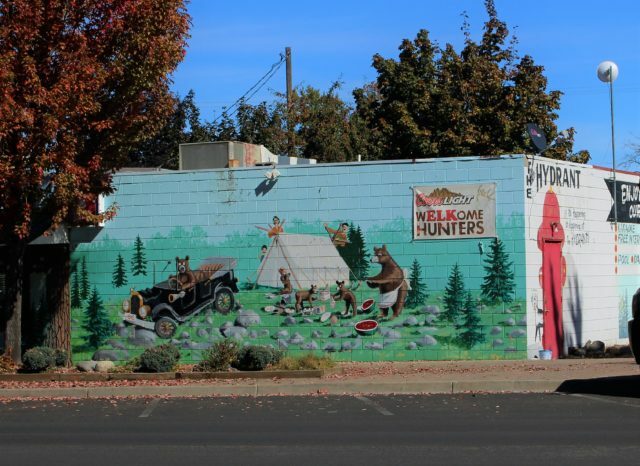 I first drove into Joseph from the Hells Canyon Scenic Byway and was spilled into a small town bustling with a pleasant mix of (mostly boomer-generation) tourists and old-time residents. The idyllic scenery is the first thing you notice; with a quaint tree lined main street stretching toward the picturesque Wallowa mountains. One sign referred to the Wallowas as “The Little Alps” – and for good reason. As I drove out to Wallowa Lake on my second day, that is exactly what the small, but dramatic range reminded me of. Joseph’s Main Street is the heart of the tiny town, speckled with restaurants “WELKoming hunters”, locals and tourists with names like: “Outlaw Restaurant”, “Old Town Cafe”, “Home Cooking Cafe” and “Stubborn Mule Saloon and Steakhouse” and a couple similarly themed hotels: “Indian Lodge” and “Bronze Antler B&B”. 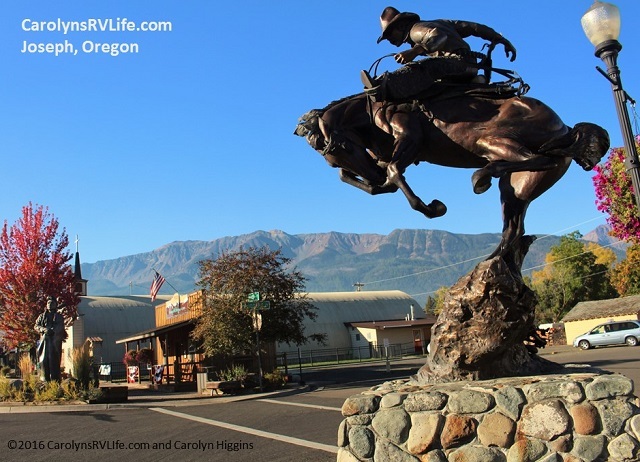 There’s also a “Cattle Country Quilt and Craft” store and art galleries full of rustic old-timey Cowboy and Indian inspired bronze sculptures, photographs and paintings of local scenery and western themes. And then there’s the usual tourist fare: souvenir shops selling Enterprise, Oregon T-shirts, mugs, shot glasses and overpriced magnets and candy; an ice cream store; a gourmet chocolate shop; espresso cafes; and the obligatory small-town True-Value Ace Hardware that carries everything from souvenir t-shirts to washing machines to guns. As my friend Bob and I ate, discussing travel plans and the weather, the man next to us busted into our conversation and gave us his weather report. He was friendly and helpful, so I forgave his eavesdropping and crashing into our apparent, not-so-private conversation. The walls were covered in old barn boards, adorned with burnt-in brands of local ranches, washed-out black and white photos of days-gone-by Joseph, and framed posters with funny sayings like, “Historical moment, an argument was won by the man of the house on this date….”. There was an old iron wood stove against the back wall that sat cold, even on that gloomy and rainy autumn day. The meal was humongous – I ordered a veggie omelet and home fries and my plate came heaped high and overflowing . It literally took me 3 days to eat it all – and I don’t have a tiny appetite! (In my RV life, I’ve become “mostly-vegan” when I eat out. Unless I only want to eat salad and French fries, it’s nearly impossible to find vegan fare in most small towns). After lunch, we walked the two blocks along Main Street to the post office to see if my general delivery mail had arrived from California. Along the way we peeked inside inviting storefronts and pined for ice cream and chocolates even with full tummies. As suspected, my mail hadn’t arrived yet (it has just left California the day before) so we headed back to the RV parking lot, behind the local grocery store, to work for a couple hours before heading out to find home for the night. We’d arrived in Joseph with two potential locations for boondocking, just a few miles from town in the Wallowa-Whitman National Forest. One was off of Hurricane Creek Road, which, according to Google maps, had a couple of forest roads that appeared to be worth exploring, and the other was outside of Enterprise, on Lime Quarry Road. The question was- as always in this area – will there be cell service so we can work? Before nightfall we headed out of town, past the tiny airport to Hurricane Creek Road. At the Joseph Grange Hall, Hurricane Creek Road turned toward the National Forest and within ¼ mile pavement turned to gravel. We passed several residences with big signs warning travelers to slow down. The forest road that Google Earth Maps showed, off to the right about two miles in was nowhere to be found (and now researching this blog, it shows a house there – that was not there a month ago! )– another Google maps mystery! We’d passed a National Forest campground and decided to turn around and stay there for the night rather than drive to Enterprise and explore another forest road so late in the day. 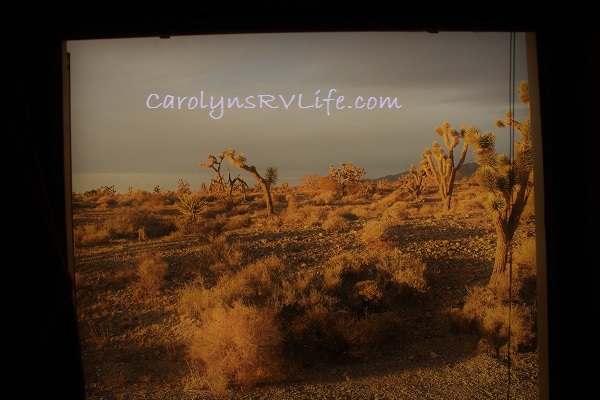 When I found a wide spot in the road, big enough for my RV to turn around in, we made our way back to the campground. As suspected there was no cell signal – so we had the night off of work! For $6/night, with all three spots that were big enough for my rig and Bob’s van open, we decided to call it home. It’s a small campground with about 13 sites, resting right on Hurricane Creek, which even at this time of year was flowing freely, providing a nice backdrop to the already cool and misty evening. The next day we drove back down to the RV parking lot in town to work for a couple of hours before Bob took off for Salt Lake City to meet up with his son who flew in from Alaska. 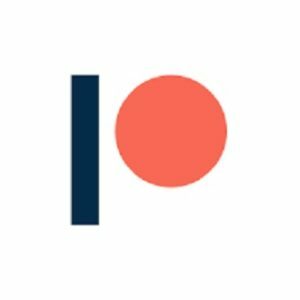 When Bob invited me to go, I debated, but in the end was looking forward to some time alone to finish exploring that part of Oregon. We’d been planning to head to Seattle to see Bob’s friend Suanne and I thought I might still head there – or maybe the Columbia River. Or Maybe Couer d’Alene, Idaho. “Who knows?” I thought, “that’s the beauty of my new life. I can go anywhere I want and I can decide tomorrow!” But I couldn’t go anywhere until my mail arrived- I still have a couple clients who pay me by check – and they are on their way! 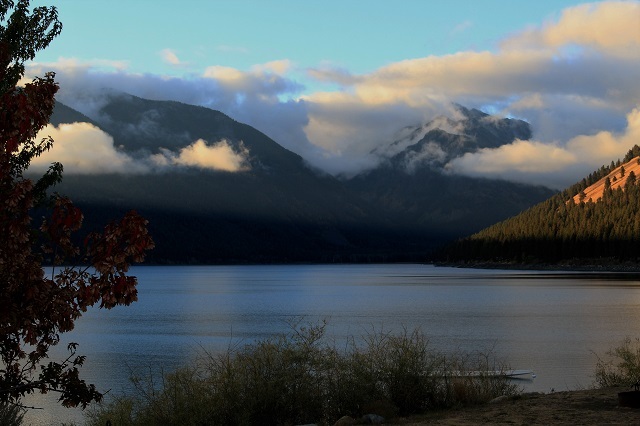 After Bob left for Salt Lake City, I worked for a few hours and then headed toward Wallowa Lake to do some exploring. But first the post office… no mail – sigh. It was Friday. That meant I was stuck there through the weekend, which wasn’t the end of the world, but I hate feeling trapped! . The drive to Wallowa Lake was scenic and I found a day use area with good 4G, a beach and a gorgeous view of the lake. I made a mental note and continued toward the State Park sprawled at the base of the Little Alps on the other end of the lake. 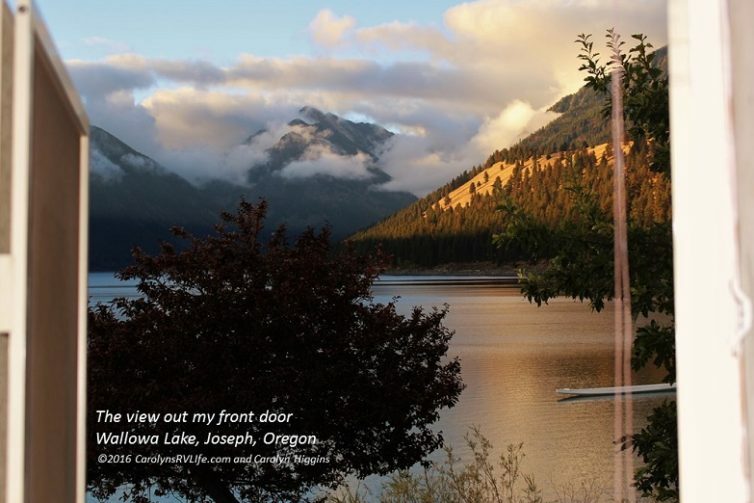 Once there I discovered a little touristy lake-side community with cafes, restaurants, hotels and the Wallowa Lake State Park. I considered spending the $30 to stay there, but there was no cell signal. I decided I’d rather stealth camp in town. I spent some time at the day use area, took Capone for a walk on the lakeshore and relaxed a bit before driving back to the RV parking lot in town to get some work done. I ended up parking in front of Joseph Community Center across from the Forest Service for the night. Other than a little bit of traffic and loud drunks passing by when the restaurants and bars closed, it wasn’t bad. I woke up early and drove to the Wallowa Lake day use area and boat ramp, made coffee, turned on my generator and got to work. Later I drove to the small neighboring town of Enterprise. 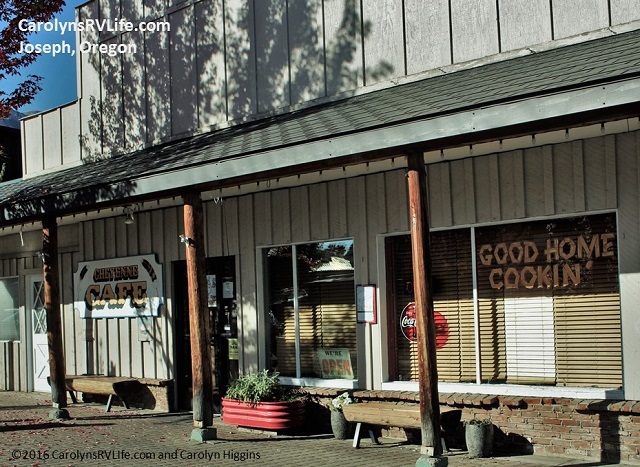 A really cool, sleepy little town, with streets lined with buildings that used to house bustling businesses – now scarce with a consignment shop, a couple of restaurants and cafes and empty storefronts and offices. Unlike the relative bustle of Joseph, Enterprise felt like a ghost town. It’s wide streets, empty and plenty of room for me to park my RV. Which was convenient since I found Gypsy Café and couldn’t resist stopping in for an almond milk Cappuccino! I also noticed ample opportunities for stealth camping around town both on the streets and near the small city park off the main drag. After hitting Safeway for a few groceries, I ended up at the little league field behind it. The parking lot was far enough away from homes, that I doubted anyone would even notice I was there. I spent the whole afternoon without seeing a single person visit the field – it was only near nightfall that a few people showed up to walk their dogs and play with their kids. I could see the curious looks as I peeked through my curtains, but I spent the night with no issue. 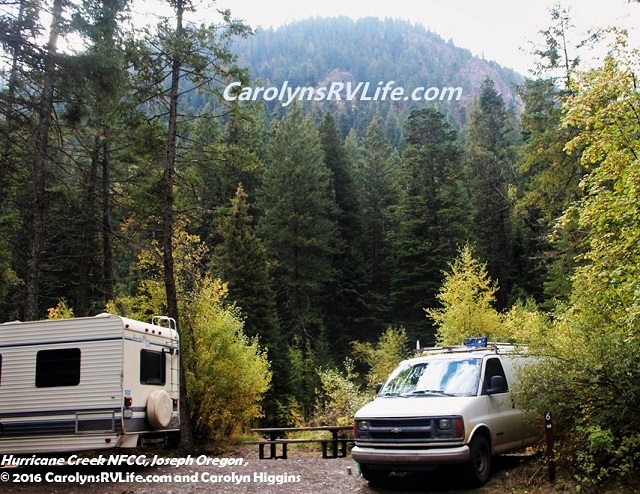 The next morning, after coffee and a couple hours of writing, I moved on to another location to get a blog published and then back to Hurricane Creek Campground. I spent a peaceful night in the dewy forest and headed out the next day to get my mail (it HAD to be there by now!) and hit the road to Coeur d’Alene! As you know from my last blog that didn’t quite go as planned and I ended up staying an extra day to get some repairs done on the RV. But at last, on Wednesday I was on my way! Only I’d changed my plans: instead of Coeur d’Alene I headed to Walla Walla, Washington! How interesting to do as you wish. I am looking at campers for my truck. Still trying to pay off stuff. I would have to work at a campground or something similar to make some money. Hoping to be out there soon to join in the adventure! Carolyn, what you do is the way I would like to travel. 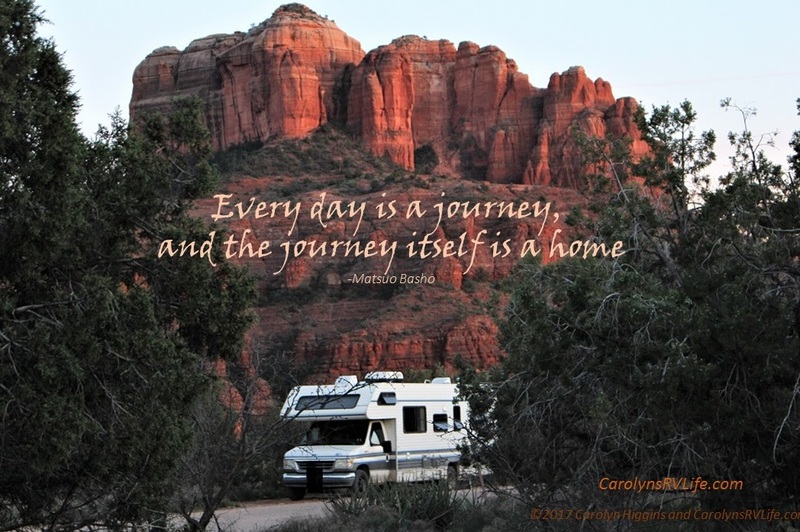 I have tried a small Teardrop style trailer and even used my csuv to camp and sleep in. But they came up very short because I had no shower, toilet, and kitchen facilities. And I have to stay clean and be able to have a modern toilet to keep me happy. I am thinking about maybe purchasing a small used class c to provide me with those basic comforts when I take my extended roadtrips. You are doing excellent on your adventures with your C. I admire what and how you are doing it. I do have one question. Are you usually available to find facilities pretty easily for dumping and filling your tanks as you travel? I would be traveling solo as you do and could probably make it at least a week or so without having to dump and fill, and still be able to stay clean and comfortable with using the onboard toilet and such. I considered myself a very frugal and efficient person. What has been your experience on this? I will appreciate your information and advice. Great questions! I can go 2 weeks without having to empty my tanks.. I only shower ever 10 days or so and sponge bath in between when dry camping to save water. 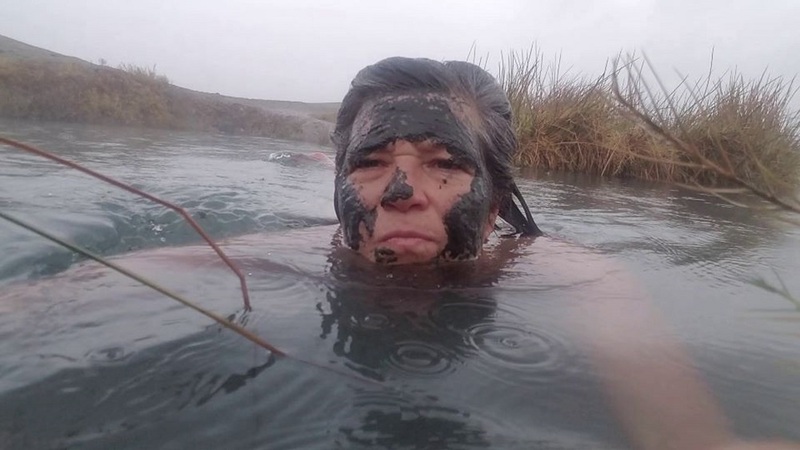 I use all natural soaps, shampoos and such, so in a pinch I can dump my gray water in the forest – FAR FROM WATER SOURCES! So far I’ve had no trouble finding dump stations. I use websites like http://sanidumps.com and rv dump stations. Many state parks, fire stations and small tourist towns offer dump stations (often free or for a small donation). It’s never been a problem. Wow, thank you for the link to the sanidumps website. That takes a lot of worry about where to take care of the dumping and filling. I never thought of the fire stations. And as many State park campgrounds I been to I should have thought of that. In my trip from Florida to California this last February I really never paid much attention but noticed that they did have the dump stations. I just never needed them at the time so I kinda put them in the back of my mind. Thanks for bringing those to my attention. There are State Parks everywhere. Great update. Thank you. Loved the pics. I love reading your blog…and the view out your door……you are right..gorgeous. Safe trVels. 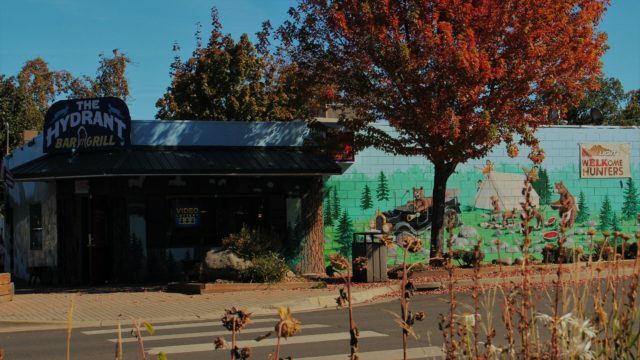 I love that area of Oregon too, and Joseph is such an amazing town with so much character. I was there a couple of years ago on a road-trip for the running of the rodeo horses through town and down the main street. I’d love to go back when I hit the road full-time next year, but it won’t be the first on the list of a thousand places to see! I loved it there. Such a gorgeous and peacful place full of kind people. I agree.. a list of at least 10000 places to see and I’d never have gone there, but my friend who I was traveling with wanted to see the Wallowas… It was worth the trip.. But like you, once is good for me, time to see new things!! !